The elementary music curriculum is designed to coordinate with the 9 standards set by the National Association of Music Educators as well as the Lutheran Addendum to the National Standards for Arts Education. 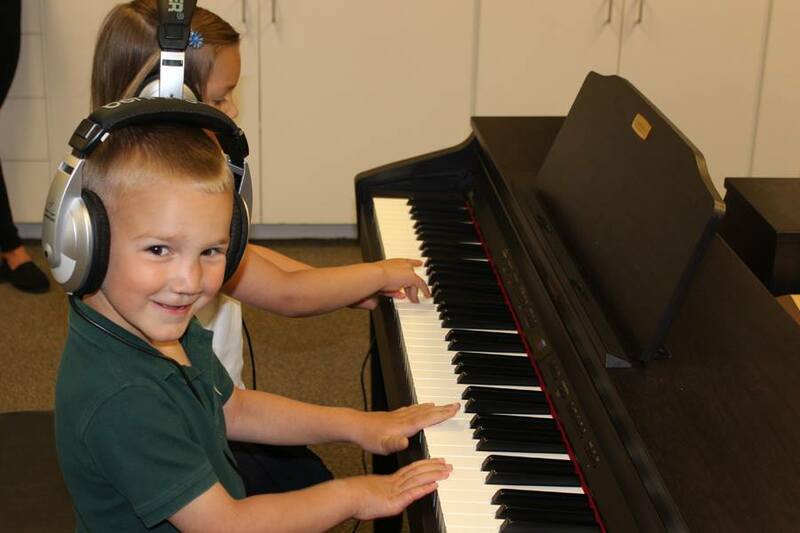 We have a dedicated classroom for Elementary School music classrooms which includes a digital piano lab. Music is an exciting and important part of your child’s education. There is so much to explore in the world of music and this year, in the elementary grades, that’s exactly what we will be learning about...music around the world! Students in Grades 3 & 4 learn how to play the recorder. This easy to learn, flute like instrument opens the doors to note reading, interest in other instruments, playing in a band, and more! All students in the elementary grades have a chance to experience the piano lab. From exploring sounds, learning notes and finger positions to playing simple songs, this is a great addition to our program! In addition to classroom rhythm instrument activities, all students in the elementary grades have a chance to experience the piano lab. From exploring sounds, improvisation, learning notes and finger positions to playing simple songs, the students love the piano lab! Students in Grades 3 and 4 also learn how to play the recorder. This easy to learn, flute like instrument opens the doors to note reading, interest in other instruments, playing in a band, and more!